In the mid-1700s, when Scottish Highlanders settled in the Sandhills region, the vast forest consisted of original growth longleaf pines that reached heights of 100 to 120 feet. Merchants cut the forests for timber and cultivated choice stands for use as masts for the Royal Navy ships. Merchants also harvested resin from the longleaf pines for the naval stores industry. Resin from longleaf pine yielded four basic products: tar, pitch, turpentine and rosin. By 1850, North Carolina's pine forests were producing one-third of the world's supply of naval stores. Resin collected from elongated, inverted V-shaped cuts in the tree trunks was distilled into turpentine. Turpentine was used as a solvent and illuminant. Tar, pitch and rosin were used for sealing the hulls, decks, masts, ropes and riggings of sailing vessels. When railroads arrived in the Sandhills in the 1870s, large-scale logging and lumbering began. As a result of logging and naval stores operations, most of the virgin growth of longleaf pines had disappeared from the Sandhills by 1900. Many of the older trees that survive today bear prominent scars of this human exploitation. Early in the 20th century, the grandfather of James Boyd, a well-known North Carolina author, purchased a substantial tract of land east of Southern Pines to save the longleaf pines from logging. He named the estate Weymouth because the pines reminded him of trees in Weymouth, England. In April 1963, Boyd's widow, Katharine, donated 403 acres of land to the state, establishing the first natural area in the North Carolina state parks system. Additional land has been acquired, including a satellite area of 153 acres known as the Boyd Round Timber Tract, which was added in 1977. The Sandhills region is characterized by a series of flat-topped, sandy ridges and relatively broad, flat valleys. This landscape is the result of large quantities of clay, sand and gravel being transported by streams and rivers flowing eastward from the Piedmont. These materials were deposited as sediment in and along the margin of an ancient sea that covered much of the region millions of years ago. After the sea retreated eastward, weather and erosion shaped the landscape into the ridges and valleys seen today. Early settlers called this area the "pine barrens" because it was covered with extensive open forests of longleaf pines. Today, the Weymouth Woods Sandhills Nature Preserve protects a remnant of the plant and animal communities reminiscent of the pine barrens of long ago. Natural areas became a part of the state parks system when Weymouth Woods was established in 1963. These areas, more suitable for education and conservation than recreation, are set aside in their natural states. The purpose of natural areas is to preserve and protect lands of outstanding scientific and scenic value for the enrichment of present and future generations. Environmental education and conservation research are important emphases in all state natural areas. The early settlers who named the Sandhills region the "pine barrens" must not have appreciated the diversity of plant life carpeting the land. The region is anything but barren! More than 1,000 species have been found in the Sandhills region, and more than 500 species are present at Weymouth Woods. On sandy slopes and ridges, turkey and blackjack oaks grow along with wiregrass and longleaf pines. These give way in the bottomlands and swamp thickets to various hardwoods, including dogwood, red and white oaks, American holly, sourwood, black titi, bay, gum, hickory, yellow poplar, persimmon and red maple. Conifers such as loblolly and pond pines are also present. As in other parts of the Sandhills, longleaf pines form the dominant plant community. Their shiny needles, which grow up to 18 inches long, produce a canopy of sparkling green atop massive, straight trunks. In the spring, small purplish male cones appear in clusters at the ends of the branches and dust the woodlands with yellow pollen before dropping to the ground. The female cones measure 6 to 10 inches in length at maturity and remain on the trees for nearly two years before releasing their seeds and dropping to the ground to become part of the forest litter that blankets the sandy soil. Longleaf pine forests are plant communities that adapted long ago to periodic burning, and their survival depends upon fire. The original forests were maintained by natural fires that usually were caused by lightning. 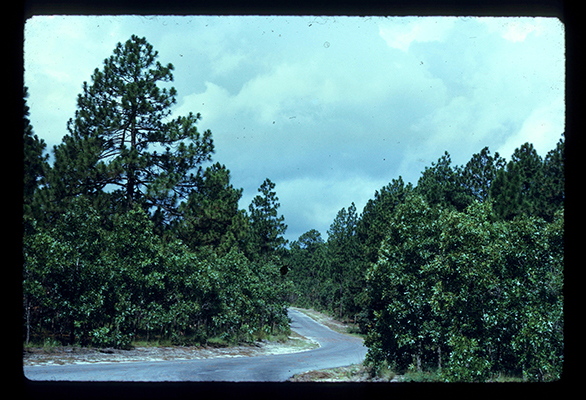 As settlement and land development increased, the longleaf forests became increasingly fragmented. This fragmentation, coupled with the firefighting practices of the 20th century, prohibited natural fires from running their course. As a result, competing plant species thrived and inhibited longleaf regeneration. The small old-growth forest on the Boyd tract and scattered old longleafs elsewhere at Weymouth Woods are a mere vestige of the vast forests that once covered the region. Prescribed fires, which simulate natural fires, are periodically set at the preserve in order to maintain the longleaf pine community through resource management. These fires remove or control competing hardwoods, provide open areas where longleaf seedlings can germinate and grow, and return nutrients to the soil. A prescribed burn will only occur when weather and site conditions are favorable and adequate personnel is available. A rich diversity of small plants ranging from lichens, mushrooms, mosses and ferns to grasses, wildflowers and woody shrubs nestles beneath the forest understory. From February to November, the park blooms with a diversity of flowering plants—some spectacular and some loved only by specialists. Species include Indian pipe, dwarf locust, trailing arbutus, birdfoot violet, wild azaleas, dwarf iris, pine barrens gentian, wild orchids and asters. One of the most interesting plants is the insectivorous purple pitcher plant, which grows in the moist areas of Bower's Bog and James Creek. Many animals find shelter in Weymouth Woods. More than 160 species of birds make the preserve a birdwatcher's haven. Species associated with mature longleaf pine forests, including red-cockaded woodpeckers, pine warblers, Bachmans sparrow and brown-headed nuthatches, are commonly seen during all seasons. Several birds that migrate from the tropics breed at Weymouth Woods. They include summer tanager, great-crested flycatcher, prarie warbler and Kentucky warbler. The great horned owl, barred owl and screech owl also enjoy the forests of the preserve. Among amphibians are slimy salamanders and many species of frogs and toads, including the rare pine barrens tree frog. Because of its specific habitat requirements, this rare tree frog lives only in southern New Jersey, southeastern North Carolina and several other locations in the southeast United States. Reptiles characteristic of the Sandhills also find homes in the park. Scarlet and hognose snakes, skinks, six-lined racerunners and fence lizards thrive in the preserve's habitats. Most of the mammals that live in Weymouth Woods are secretive or nocturnal, so they are seldom encountered. Fox squirrels, however, are occasionally seen scampering across trails. A relative of the more common gray squirrel, the fox squirrel is larger and has variable amounts of black on its head, body and tail. The range of this mammal is more restricted than that of its cousin's, but the mature stands of longleaf pine are one of the fox squirrel's strongholds. The white-tailed deer is the largest mammal seen in the preserve. Other animals encountered include the raccoon, gray fox, bat, opossum and cottontail rabbit. The red-cockaded woodpecker, which became an endangered species in 1970, is a native of the longleaf pine forest at Weymouth Woods. Unlike other woodpeckers that roost and nest in the softer wood of dead trees, the red-cockaded woodpecker digs cavities in the heartwood of living, mature pine trees. The red-cockaded woodpecker is a social woodpecker that lives in clans of two to nine birds. A clan consists of a breeding pair and its "helpers," usually non-breeding adult males. The helpers assist in incubating eggs, searching for food, defending the territory and digging new cavities. The clan roosts and rears its young in a colony, a group of two to twelve trees with cavities. Cavities are usually located 20 to 50 feet above the ground and beneath the lowest live branches of the trees. The excavation of a cavity takes months and often years. Excavation begins with a shallow hole that is extended through sapwood as an upwardly sloped tunnel of six or more inches. After reaching heartwood, which lacks flowing resin, the birds excavate downward to form a roosting chamber, typically typically six to 10 inches deep and three to five inches wide. To deter predators from the cavity, the birds chip bark from around the entrance to induce the flow of clear, sticky sap. Numerous other animals, including southern flying squirrels, eastern bluebirds and other species of woodpeckers, compete for the use of completed cavities. The range and population of the red-cockaded woodpecker have been reduced in recent years, primarily due to the loss of habitat. Growth of the hardwood understory above 15 feet can inhibit the excavation of cavities at otherwise suitable sites, and colonies may be abandoned when the understory grows this tall. Prescribed burning helps to maintain a suitable habitat for this endangered woodpecker as fire removes ground litter and undesirable undergrowth. North Carolina Division of Parks and Recreation. Weymouth Woods State Natural Area. http://www.ncparks.gov/weymouth-woods-sandhills-nature-preserve/ (accessed May 17, 2016). Publications and images from NC Digital Collections that reference Weymouth Woods State Natural Area (accessed May 17, 2016). Weymouth Woods State Natural Area. Photograph. 1970. North Carolina State Parks collection.